We're taking a detailed look at the Fortnite Season 8 Week 4 Challenges! 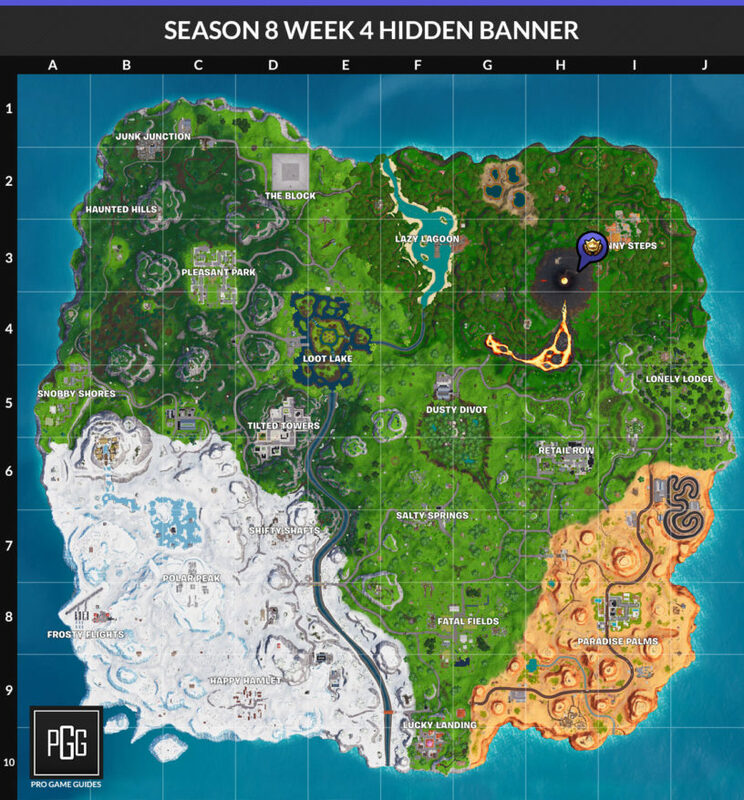 Our Fortnite Season 8 Week 4 Challenges List and Cheat Sheet brings you all of the solutions and answers for the challenges you need to complete for the week. We have maps to treasure and item locations, as well as tips for completing all of them as quickly as possible! 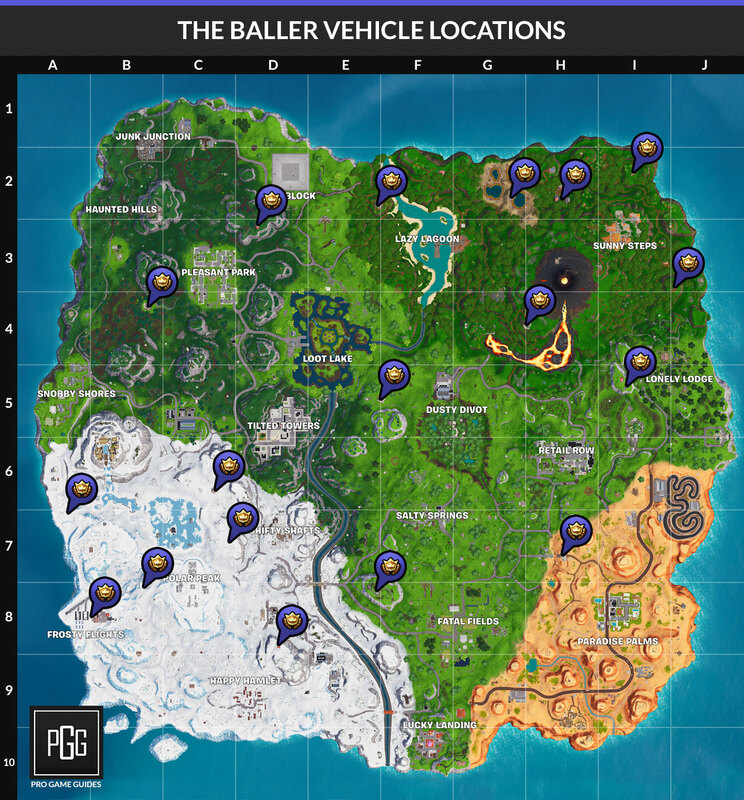 This week we're landing at various spots all over the map, using The Baller in different matches, getting eliminations with a scoped weapon and a suppressed weapon, launching ourselves through structures with a Pirate Cannon, searching Buried Treasure, eliminating opponents at Happy Hamlet or Pleasant Park, and finally we're outlasting opponents in a single match! 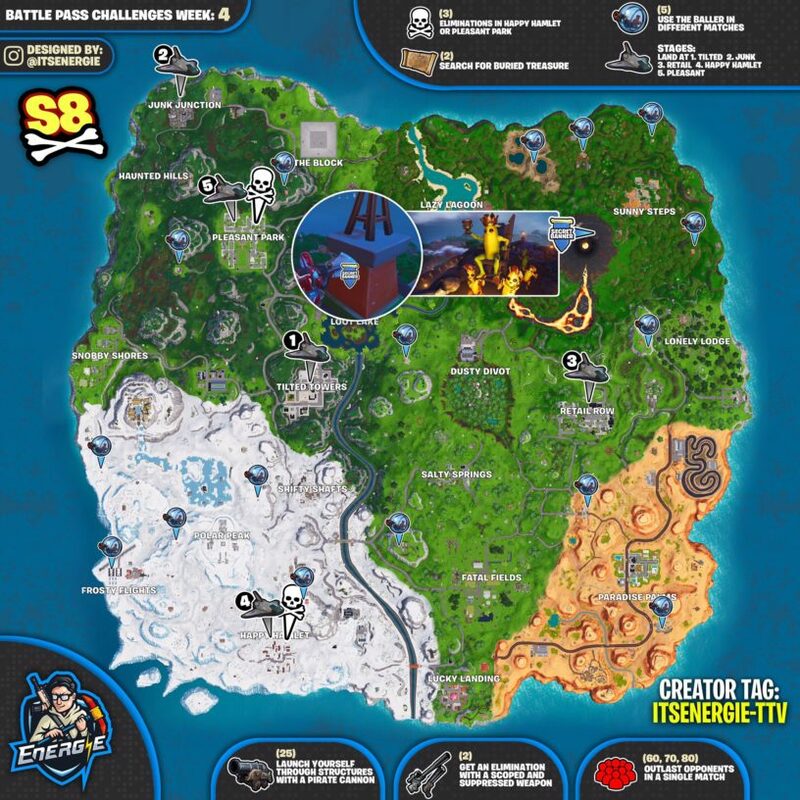 If you want to check at where to find all the challenges, here's a cheat sheet for you! Check below for more detailed information on these challenges. Credit to ItsEnergie. This is a five stage challenge, and you'll be landing at different areas on the map. You start off with Tilted Towers and then go to Junk Junction, Retail Row, Happy Hamlet, and finally Pleasant Park (where you need eliminations). Pretty easy one, but finding a Baller now might be a bit more difficult since they nerfed the spawn rate down a bit. If you are curious about Baller locations, check out our guide to them or the map below. Not too difficult, you can use the Scoped Assault Rifle or the Thermal Assault Rifle. You also can try out the Suppressed Pistol or SCAR which should do the job fine. You don't have to do both of these in a single match, so they can be done over time. There's a ton of pirate cannons in the Lazy Lagoon area, so that would be my main drop point when trying to complete this one. There's cannons at each of the pirate fort locations, these are scattered around the map. This is going to be the most difficult one to complete. Finding a Treasure Map can be pretty hard because they are fairly rare, and then you have to reach the location without getting eliminated. I'd try landing far away from the bus path and just opening a ton of chests. If you find one, the location is likely not too populated. Happy Hamlet is going to be the less populated option, but if you are really looking for fast eliminations then I'd head to Pleasant Park. Just make sure you get a gun before anyone else. This is a three stage challenge, you'll need to first outlast 60 opponents, then 70, and finally 80. You have to do these in a single match, so be sure to be careful when attempting it. If you really want to finish this quick, then the best way to do it is to just hide your way to victory. 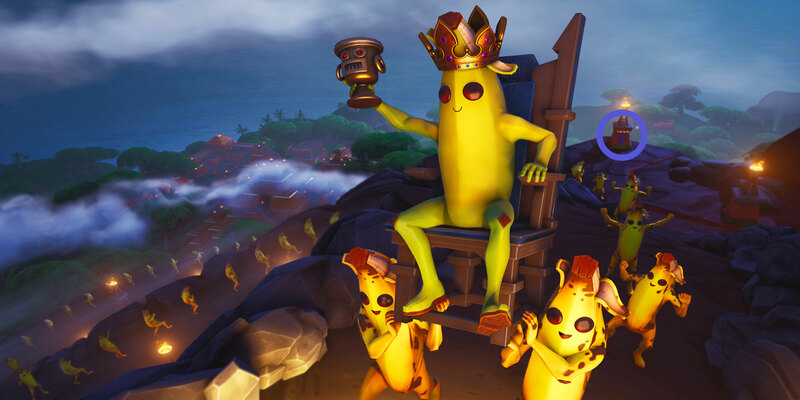 Once you complete all of the week 4 challenges you will receive this loading screen of the crowned Peely being escorted up the volcano. Well, everyone appears to be happy, but I think they are getting ready to throw the king Peely into it! Anyway, check out the lantern to the right of the throne for the hidden banner. This location is right on the volcano where the path leads to the top of it. Check the map below for the exact location! The Loading Screen’s name is Ripening Ritual and I don’t know the descripton. For some reason I can’t reply so I posted a new comment. Thanks, someone got me the information it’s added to the list now. The third one is there, but Peely one isn’t. Does anyone know the name and description of it? When I outlasted 60 opponents it didn’t work and I’ve tried a couple of time but it still won’t work. Can u help me please. Are you doing it in a regular game or an LTM? I imagine it only works in normal games.